Snaps onto the zipper to extend the pull tab. The Zip-Grip Zipper Pull is ideal for persons who have difficulty grasping and pulling small zipper tabs. Just insert the peg of the Zip Grip through the hole on a standard zipper, fold in half and press to snap shut. Ring diameter measures 1" (2.5cm). Sold in a package of 6. Snaps onto the zipper to extend the pull tab. 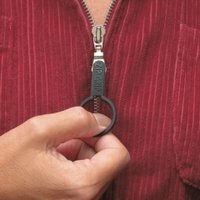 The Zip-Grip Zipper Pull is ideal for persons who have difficulty grasping and pulling small zipper tabs.